Big Brothers Big Sisters Twin Cities approached ArcStone with a need to reach their audiences in a way they hadn’t before – their cause is changing lives and they weren't able to fully communicate that to their audience. We wanted to help them find the most effective way to connect youth with the right mentor. BBBS' previous website template left their organization feeling tied down; the template was used by Big Brothers Big Sisters National, limiting them to a structure that wasn’t personalized to their specific community. Moreover, the website was outdated and hard to update. In the end, the website needed a review and redesign to ensure it was serving its purpose. To start out, we conducted a thorough analysis to inform our plan, before diving into the redesign. 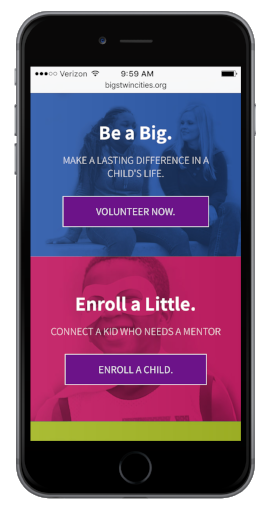 We felt the greatest need for BBBS was to understand their four main audiences and design a site that could drive these users to see how great their impact could be. From the “Bigs” (volunteers), to the “Littles” (the ones BBBS serves), to the potential donors and general public – ArcStone interviewed each audience to clarify messaging and goals. We uncovered their painpoints with the site and found areas in which we could clarify language and ease user experience. Next we crawled BBBS’ previous site, first to study how users were flowing through the site, looking at traffic and click analysis. Tools like Google Analytics data, Google Webmaster Tools and other heat-mapping software helped us understand user behavior and clarify what the new sitemap should look like. Through crawling the site we also came up with a comprehensive list of BBBS’ content, learning what was useful to keep and what technical errors or unused content needed to be revisited. We were able to remove penalties and broken links, stengthening the site's overall SEO. Similarly problematic to the health of the site, their blog was previously on a separate domain, and we recognized how integrating it with their site would be far more beneficial to their users and traffic. Finally, ArcStone used the information we'd gathered to understand what keywords and themes would be most effective for the BBBS audience, drawing on this to inform each part of the design and messaging. With their copywriter, we focused on messaging that highlighted the benefits and impact of mentoring. We wanted BBBS to capture a user's attention and draw them into the cause right away. To do so – within their budget – our video producer took five of the videos BBBS already had, and created a striking homepage video. The best way we could meet our goals was to build a custom WordPress site. Knowing that their nonprofit team did not have the time or budget to call up a developer each time they needed a site update, having an easy-to-use CMS such as WordPress was central to their needs. Now they can invest their time into improving lives, rather than just changing their website. Once the redesign and development got underway, we were confronted with a tight deadline as the scope of the project extended. We used the skillset and materials BBBS had on their side and worked with what we could offer to make sure we met both the timeline and the budget. Their site is now mobile-friendly, it's easy-to-use and update, and most importantly, it speaks to each audience member in a powerful way, calling them to take action.